myCNAJobs.com Job Openings - Recent job openings in the area. myCNAJobs.com Interview Guide - Free, downloadable CNA Interview Guide. Often times schools like to post this link directly to your site or distribute the booklet to students. Feel free to use it as you see fit. CNA Scholarships - Info about our nationwide CNA Scholarship. The way it works is that in exchange for matching it for $250 and linking to the scholarship application information, we do a co-branded press campaign designed to get more eyeballs to your school. Accurate Home Health Service searching for caring, motivated RNs, LVNs and CNAs. If interested, please email kkelly@vni.edu no later than March 20, 2018.
is located off I10 in Brookshire, TX, about 6 miles west of Katy. Our facility is always looking for qualified LVNs and CNAs to care for our residents. We have immediate openings for 2-10 shift. Pay rate: The pay rate will be 8.25 for non-certified and 8.65 for certified. Setting: The setting will be in a group home setting, assisted living setting, and or Adult day Care. Our residents are individuals who have all levels of IDD intellectual disability disorder and or mental illness. At this time we are not able to accept any one who has a criminal record. NOW HIRING - CNA, CMA, LPN & RNs! The client is looking to interview and hire this week! If you are interested please forward your update resume to me at dwells@ashtongrouphealthcre.com. I will review your information and reach out for an initial interview. Thank you. 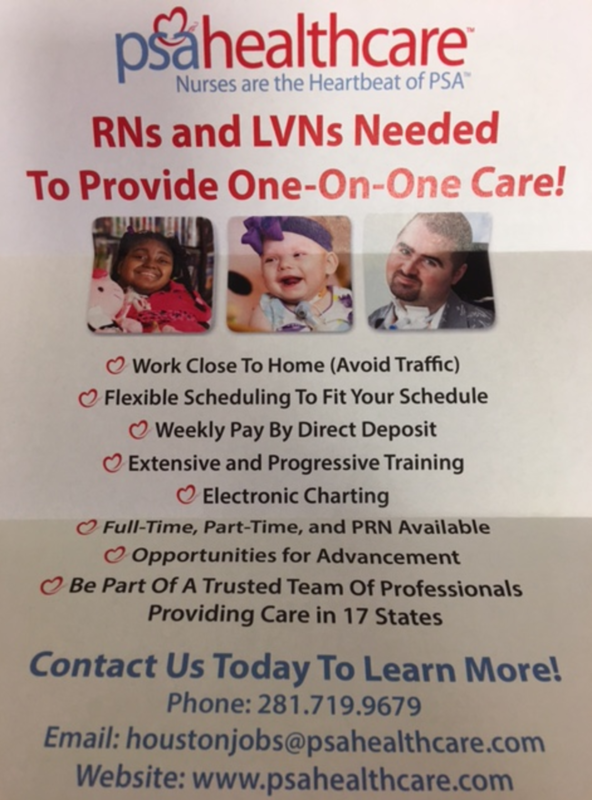 RNs and LVNs Needed To Provide One-On-One Care! Busy Sugar Land Allergy Practice is looking for a LVN who is friendly, organized and works well with others. This is a full time position with competitive salary and benefits. There are no weekends. Willing to train so no experience is necessary. The hours of the practice are: Monday: 8am-5pm, Tuesday: 9an-7pm, Wednesday: 9am-5pm, Thursday: 8:30am-6:30pm, Friday: 8am-4pm. Please email resume: slahealth97@gmail.com or fax to: (281)494-4605. Every Saturday and Sunday from 8am-12 noon. 1 year long-term care experience required. LVN or RN two days per week.